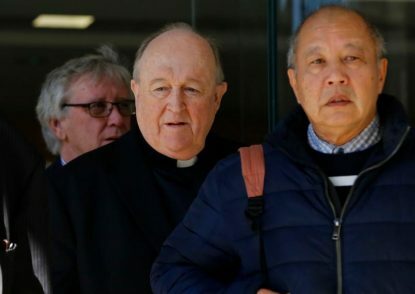 NEWCASTLE, Australia (CNS) — An Australian judge overturned the conviction of Archbishop Philip Wilson, whom a lower court found guilty of failing to report allegations of child sexual abuse by a priest. New South Wales District Court Judge Roy Ellis ruled Dec. 6 that there were reasonable doubts about Archbishop Wilson’s conviction, which was handed down by a lower court in Newcastle in May. Defense attorneys argued that evidence pointing to the archbishop’s knowledge of the alleged abuse was circumstantial and that he was innocent of the charge filed against him. Ellis also dismissed an appeal by a New South Wales prosecutor who argued against the leniency of Archbishop Wilson’s home detention sentence. The archbishop had faced up to two years in jail when he was sentenced. Archbishop Wilson, who was appointed to the Adelaide Archdiocese in 2001, had been diagnosed with early stages of Alzheimer’s disease shortly before his trial. Throughout the court proceedings, he testified that he had no memory of the conversation with the 15-year-old.